CFA Inlet Caps - Vortox Air Technology, Inc. 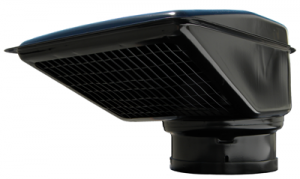 The CFA or Forced Air style Inlet Cap is designed for truck use at highway speeds. Its angled screen eliminates the accumulation of snow and ice, which will shut down a diesel engine. The frontal air intake design allows water to flow to the back of the cap where it drains out of the slot.